We decided to sleep in today. I was up at 0700. Breakfast was at 0800. 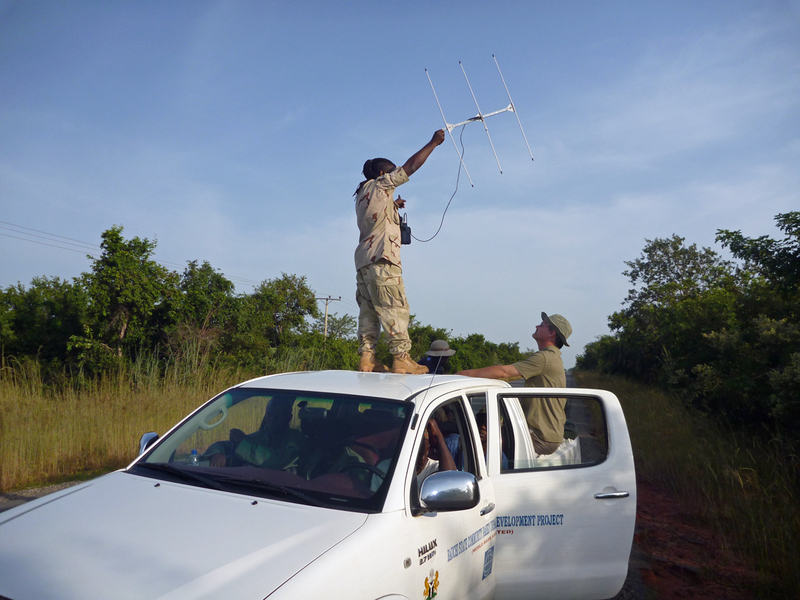 After breakfast, we did training on the use of the VHF telemetry equipment that the rangers will use to monitor the elephants. After lunch, the rangers headed to the field to look for fresh elephant signs. We drove to the approximate area of the latest satellite location for the elephant we collared yesterday to see if we could pick up a VHF signal from her. We were able to pick up her signal. The rangers did not find any new elephant signs. At 1900, elephants were sighted on the main road in the vicinity of a cell phone tower. We went out to the site to see if it was the herd of the same elephant we collared yesterday. 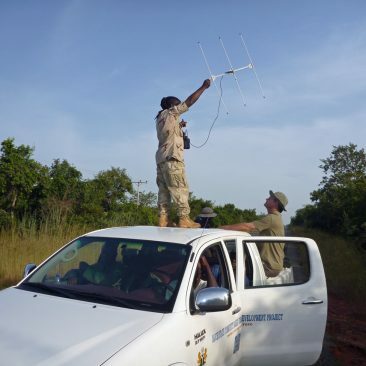 We detected the signal from the collared elephant with the VHF receiver at the point where he elephants were seen, indicating that it was the same herd. Tomorrow will be our last day in the field in Nigeria. We had additional reports of elephants on the main road in Yankari. We drove to the first waterhole south of the entrance to the Reserve. There were numerous fresh elephant tracks and stool around the water hole. We followed dung piles on the road to where the elephants left the road and headed west. 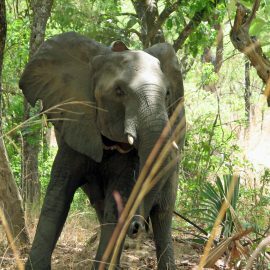 We were able to pick up the VHF frequency of the collared elephant, indicating that it was the herd of the collared elephant. We continued to the northern boundary of the park and drove the cut line. There were no fresh elephant signs. We drove north to a village and hit a maintained dirt road. There were no reports of crop raiding in the area. We headed back to Wikki. After lunch, we rested a bit, then went swimming in Wikki Springs, a natural, clear warm-water spring. We had an early breakfast and packed up everything. We then had a press conference to answer questions about the elephant collaring. After the press conference, Anderw, Aisha and I drove to Gombi and flew back to Abuja. Aisha took us to a nice Chinese restaurant in Abuja for dinner. After breakfast, Aisha sent a driver to take me to the State House Veterinary Clinic, of which she is the director. The State House is the equivalent of the White House in the U.S. Dr. Aisha takes care of the police horses, guard dogs, sniffer dogs and a zoo on the grounds of the State House. Dr. Aisha gave me a tour of the clinic, and then arranged for a driver to take me back to the hotel to meet Andrew, and then on to the airport for a flight to Calabar. We were met in Calabar by Rich Bergl, who had been in Cross River National Park testing some field equipment. Andrew invited Rich and me to his house for dinner.